• Intriguing, unique character of blooms that are a delight to behold . • Great ornamental value after flowering because flower heads continue to provide an interesting display even after colors have faded. • Distasteful flavour for animals, so they won¹t eat any part of them. Alliums come in all shapes and sizes and are lots of fun to grow. 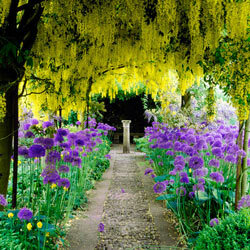 They fit into almost any garden setting and provide a much-needed bridge of color between spring and summer flowers. Sometimes called “ornamental onions,” alliums do best in full sun with well-drained, fertile soil and good moisture. Plant them in September or October about 20–25 cm deep. Allium really look best in the company of other summer bloomers. Sweet alyssum, rock cress, bachelor's buttons, coreopsis, sweet William, foxglove, baby's breath, daylily, iris, red hot poker, coralberry, barberry, Japanese maple, Deutzia rosea, weigela and Geranium pratense are just some of the companion plants that look fantastic with alliums.